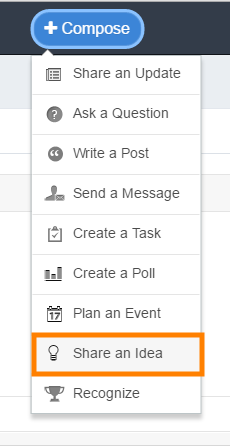 /Ideas & Campaigns /How to Use Idea Module in Mangoapps? As a domain network user, you can see everyone’s ideas. However, guest users cannot see anyone’s ideas because they are restricted to the groups that they were invited to. As a network user, it’s encouraged to comment on people’s ideas so that details can get added while the idea is being refined. In this way a small idea can grow into a well-designed process or product breakthrough. Idea navigation icons on the left side menu. In the search field, type keywords related to the idea you’re searching for and click “Search”. Filtered search results will show for “Ideas” and “Idea Campaigns”. There are two ways to submit a new Idea. 1. Simply click the “Compose” button on the top and then select “Share an Idea”. 2. Navigate on “Ideas” in the left navigation bar and click “Post an Idea” on the top left. Then fill in a recognizable “Title”, detailed “Description”, and optionally create “Tags” to use as search and categorization for your idea. If you know that your idea is patentable, check that box. Optionally, attach a file. 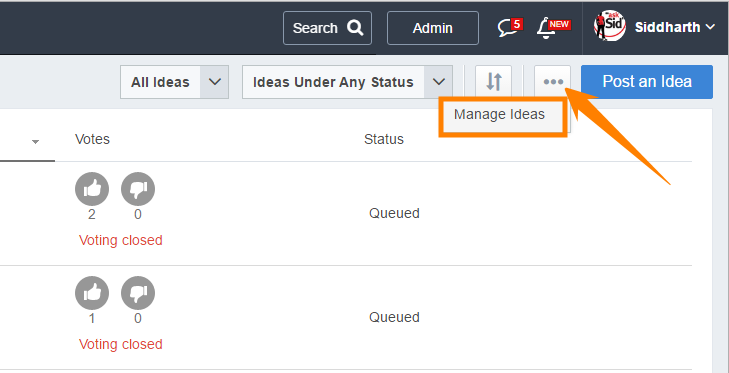 If you are an Idea admin you can access these settings under the 3 dot manage settings and select “Manage Ideas”. Follow up with the idea team members about the status of your idea. You can follow up via direct message, instant message, or face-to-face. Encourage followers to comment on the idea so that other MangoApps members have a chance to see some comments on your idea. Have people “Vote” for your idea with a “Yes” or a “No”.